Surprisingly, we also encountered Native American Indian ruins just past the beach we had visited the night before. Continuing on, we crossed to the middle of the Kaibab Suspension Bridge, where we stopped to watch a Ranger take water samples from a cable car suspended above the River. On the far side of the suspension bridge, we passed through a 75-foot tunnel that had been cut through the immensely thick Vishnu Schist (the oldest rock layer at the bottom of the Canyon).Then we began the intense trek up the first series of steep switchbacks that we would encounter that day. It was hard work, Kurt and I had to stop every 100 feet or so to catch our breath, but thankfully the sun wasn’t shining on us yet. It seemed as though the switchbacks would never end but finally we reached a long, straight stretch. Now don’t get me wrong, it was still a fairly steep incline, just no longer a switchback. 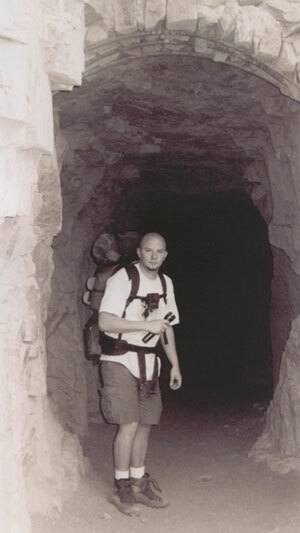 On the trail below us, we could barely make out 2 mule trains steadily making their way out of the Canyon. After much huffing and puffing and wondering whose wonderful idea this whole adventure had been, we reached a rest house called the Tip Off located at the edge of the Plateau, roughly 1/3 of the way up elevation-wise (1600 feet above the River). Gratefully, Kurt and I took off our packs and sat down in the shade. It seemed like a good time to partake in a little breakfast as well, so we ate an orange and granola bar each. After a little contemplation, we decided we couldn’t handle any part of the MRE’s at this point. Funny, how they tasted so good just the day before. I’m not sure if Kurt and I were overly sarcastic because we were tired or what, but we had to laugh as two mule trains arrived and we overheard the tourists complaining about their stiff muscles acquired from sitting atop their mules. After resting for all of half an hour, we loaded our goods on our backs and continued the journey up. We were able to enjoy the straight road for a short while until we reached the next set of steep switchbacks, and this time I do mean steep. The initial switchbacks by the River were nothing compared to these. Also, by this time the sun was beating down on us and there was no shade in sight. It was literally all we could to make it the fifty feet up one leg of the switchback before we had to stop and catch our breath, bending at the waist to relieve our legs of the weight of our packs. We encountered several groups of people along this section of the train and they all seemed to say the same thing: “Folks never hike up this trail.” Of course we had to heartily admit that we love to do things the hard way. 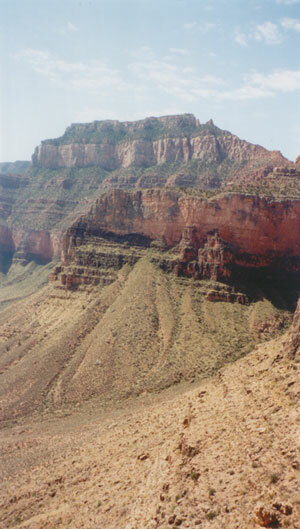 In contrast to the Bright Angel Trail, the South Kaibab Trail provided incredible sweeping views of the Canyon. This trail followed the edge of the main canyon and the panoramas of the main canyon and river below made the pain worthwhile. After reaching the top of these lethal switchbacks Kurt and I did manage to find a small amount of shade tucked underneath a cliff. We sat down to drink some more water and offer words of encouragement to each other. Actually, this stop provided the perfect view as we could see our campground in the distance below us. At least this helped us to feel like we had accomplished a something. Kurt and I pressed onward, making it a few hundred feet at a time then stopping to rest. Following this method, we eventually (and I do mean eventually) made it to Cedar Ridge, a rest house a mere 900 feet below the rim. Cedar Ridge is actually the day hike destination for the South Kaibab Trail, so the area was crawling with people again. 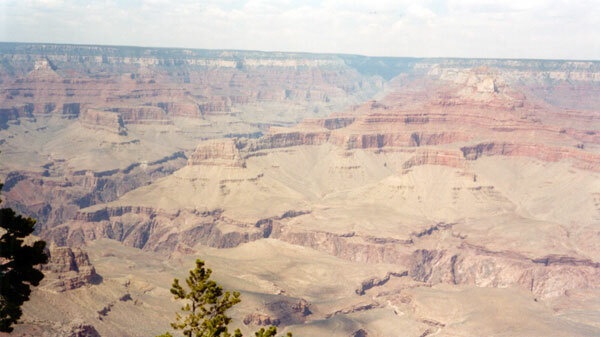 Our Grand Canyon solitude was over. At last, there were trees of considerable size, and Kurt and I thought it would be most prudent to rest under one for awhile. While we were there, we snacked on tuna, crackers, and water. In a fit of spontaneity, we also took off our shoes and propped our feet up on a tree, enjoying the cooler temperatures. This short break, and the fact that we were nearly finished, renewed our vigor and Kurt and I set off with enthusiasm (well, as much enthusiasm as we could muster). Upon leaving the rest house, we ascended the trail through a short series of switchbacks and then once more plundered down a long traverse. Of course we still had to stop every few hundred feet to catch our breath and encourage each other, we didn’t gain that much energy from our break. It seemed that the altitude really had quite an effect on us, which we hadn’t really considered. Every time we stopped to rest, we also enjoyed the views and of course took pictures. After what seemed like an eternity we reached the final series of switchbacks just below the rim. 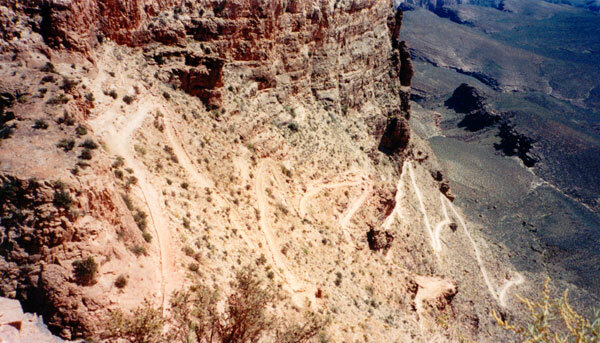 If we could only make it through the switchbacks, we would find the rim. Even in our joy, we still had to take one leg of the switchback at a time, stopping at each turn to catch our breath. Incredibly, we did make it through the last harrowing hundred yards and Kurt and I emerged over the top, victorious! Even though the ‘Rocky’ theme music wasn’t playing for us, I was still ecstatic about reaching the top and somehow, from somewhere, I still had enough energy to jump up and down and even managed a shout or two. Kurt and I were amazed that we made it 7.3 miles with an elevation change of 5820 feet in one day. Gladly, we sat down (on a bench!) to wait for the shuttle that would take us back to the parking area. While we were waiting, we gratefully emptied our packs of our trash we carried back up. Soon, the shuttle arrived and we found it was a struggle to get on. It was so difficult to climb the 2 stairs into the bus! Our muscles had ‘frozen up’ from sitting too long (not even 5 minutes) and screamed at us with every move. Kurt and I had to switch buses at the Visitor’s Center (where we got some very strange looks), but we eventually made it back to the parking area in which we had left the rental. The next trick was finding the car. We hadn’t parked in a true parking lot and although we remembered approximately were we parked, we had a little difficulty finding the car. After 15 minutes or so of walking around (and we thought we were done walking around!) we found the car - right where we left it. We gladly dumped our packs in the trunk and set off on our wheeled means of transportation to satisfy our appetites. We said good-bye to the Canyon and drove back to Tusayan, where we found a Wendy’s (it was about the only restaurant in the town). Once again, we got some very strange stares since we were covered from head to toe with red dirt. After attempting to wash up a bit in the bathroom, Kurt and I ordered the largest cheeseburgers on the menu, complete with fries and caffeine. It was amazing how wonderful Wendy’s hamburgers and fries tasted – there was even ice in the drinks! After filling our tummies, we climbed back in the car and drove to Flagstaff for a real bed. Yet again, I got strange looks when I checked into the motel. I’m sure it had nothing to do with the way I smelled.